Caught the boys last night at the Auditorium Center in Rochester last night, and surprised to see a good number of people there. It wasn't quite a sell-out, but being the middle of the week, and the average age of the concert goers was mid 40s, it was pretty darn respectable! Our commercial FM rock station jumped on the promotion wagon a little too late, but did manage to bring in enough fans to make it a success. Giving away a ton of tickets the day of the show, I wonder how many paid attendees there really were! I purposely have avoided reading the concert reviews thus far, but I had a pretty good idea of what to expect. I'm glad to say I was pleasantly surprised at what they chose to play! I was a bit bummed that they didn't do their respective solos, but that just allowed more time for real songs to get performed. Anderson was in fine voice, as always, and seemed to be feeding off of the energy the crowd was displaying. Taken off guard by the band swooping into Yours Is No Disgrace from The Firebird Suite intro instead of Siberian Khatru, as would be expected, I said to myself, "Hey...they might decide to mix things up a bit here tonight", which they did. YIND was a killer opener, with Mssrs. Howe and Squire jamming at peak level. For a soundboard tape of that one...! Without getting into a total song by song breakdown, let's just say I was pleased with their setlist (Yeah baby! Perpetual Change!!). That said, I got a couple of gripes that need to spew forth! The band was not at their best, plain and simple. Granted, with Yes even mediocre is darn good, but expectations tend to run a little high with a group of musicians as talented as they are. First off, the house sound was inconsistent and it messed with the band onstage more than once. Chris Squire was obviously struggling to hear himself during one tune and shrugged at the audience as if to say "Sorry, but I have to play this one from memory!". I was fortunate to sit fifth row center, so I got hit with the stage amps to help mix it up from the PA. But I could swear that Squire's rig didn't even get to the PA at all. There were times he could barely be heard, especially when he was playing his Fender Jazz bass. The total difference in tone and volume between that axe and his trusty Rickenbacker were killing me. Overall, the sound was better than what I experienced at Massey Hall in 97, when his bass pedals drowned out everything else being played. Can Yes manage to find a sound man who can deal with this? Of all the times I've seen them, it seems they have the best sound when playing outdoors, their sound guys have a tough time dealing with the ambience of smaller amphitheatres. Another consistent complaint with this Yes lineup is that Sherwood can almost never be heard. Yeah, I know, he's a junior member and his role is to act as filler. But with the gear he's got, he must've switched guitars at least seven or eight times, he should be a little less buried in the mix, IMHO. There's almost no chance of him upstaging Howe, so can't someone cut him some slack? It's also apparent to me that even his stage presence is subdued, by design I suspect. Is Steve Howe THAT paranoid? 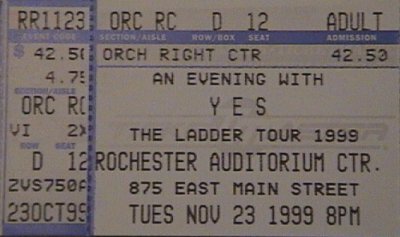 This was the first time Yes played The Auditorium Center in Rochester although Steve Howe had played there back in the early 80's as a member of Asia. This is a great old theatre and Jon said for tonight they would call it The House of Yes. And it was. Yes is an intensely loved band by its fans. Although a large portion of the balcony was empty (the concert was resonably well advertised for a change) the people that did attend were enthusiastic and standing ovations were the norm. The set list followed previous shows and the band did do Awaken for this one vs. Close to The Edge. Awaken is my personal favorite of all their songs and this one took on a special feel when the band released small silver and white pieces of confetti-like paper from the ceiling above during the final section of the song. The confetti twirled as it fell and totally filled te air in front of the band. A very simple but effective visual enhancement for the song. I felt Chris was much more playful then at the previous shows over the last two tours. He seemed to be having an especially good time. And Billy stepped out of the background and played some outstanding lead guitar. I did pick up the program booklet (recommend buying it for it's extensive narrative as well as pictures)and in it Igor mentions the effect Billy had on the vocal arrangements for The Ladder. Bravo, Billy, and I wish you many years to come with Yes. Prior to the start of the show I reflected back on my last 25 plus years as a Yes fan and was glad that Yes will probably be the last band I see live before the new millennium. I certainly hope we will continue to see them perform and that they will continue to make great records like The Ladder. They do however, need our support because the continued existence of the band into its fourth decade can indeed be Fragile.